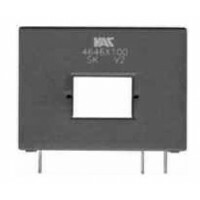 VAC offers five new current sensor series for PCB mounting in which the electronics is integrated. Three of the new series contain their own primary conductors, two series however are made with openings for passing through separate primary conductors. The patented VAC principle of the compensation sensor with magnetic probe as a zero field detector is distinguished by maximum precision of the current detection. The electronics of the new VAC current sensors are concentrated almost entirely in a new IC, which is a common development with a leading semiconductor manufacturer.